As Lisa Bersales of Philippines Statistics Authority said in the closing ceremony, national statistical offices and official statisticians share a common language filled with acronyms like UNFPOS, SDMX, and e-GDDS. While official statisticians such as herself came to the United Nations World Data Forum speaking the language of statistics, they are leaving with the knowledge that there are many more languages left to learn. Open data is one of them. The Forum was marked by important moments for open data such as the one with Lisa Bersales. Whether they happened on the plenary auditorium stage or over coffee in the hallway, the Forum helped create a better understanding of open data opportunities and accelerated the connections between official statisticians and open data experts. For two communities marked by limited interactions, this is a breakthrough worth celebrating. Riding the momentum of the IODC in Madrid, Open Data Watch set off for Cape Town with an ambitious agenda. Alongside our organized sessions, we hoped for even more progress for strengthening the links between open data and official statistics communities, collaborative conversations between open data groups, and a conference attendance from a wide range of sectors and stakeholders. We may have set our expectations high but we were not disappointed. Below we share the open data breakthroughs we are so excited to have witnessed. √ A coordination and mobilization of all actors in the data revolution. The Forum is the result of one of the five key recommendations outlined in the “A World That Counts” report. Bringing together more than 1,400 data producers, analysts and users from private, public, civil society and academic communities around the world, our wish for an inclusive and multi-stakeholder crowd came true. With the conclusion of the first ever Forum, we hope it sets an international precedent for an established and inclusive convening for the data revolution under the UN leadership. √ A global vision for harnessing the power of data which promotes open data principles. We are so pleased to see the inclusion of open data in the Global Action Plan for Sustainable Development Data. The Plan serves as a collective commitment for better data to improve lives and a framework for building the statistical capacity necessary to achieve the demands of the 2030 agenda. The presence of open data in the plan speaks volumes to the legitimacy and internationally recognized importance of the role of open data in the data revolution. √ A new approach to statistical capacity development strategies that includes open data. The Forum allowed us the opportunity to take a closer look at our current concepts of capacity building and examine where shifts to our approach are needed. NSOs play a unique role as leaders within their governments to coordinate and release official data but they still face a broad scope of challenges in implementing open data practices and standards. A new approach – coined as Capacity Development or CD 4.0 – shifts from a supply-driven, national statistical system-limited and bilateral approach to one that addresses open data challenges; expands to include multiple data producers and users; focuses on data literacy and impact; and expands beyond strengthening only technical skills. √ Links are strengthened between official statisticians and open data experts. The International Open Data Conference sparked conversations between the open data and official statistics communities. Sessions such as “Making Official Statistics Open by Default” are proof that those conversations have continued. The room was filled with country representatives of national statistical offices, open data experts, and civil society officials, showcasing the broadening and deepening demand for national statistical offices to open their data. At this stage, it is not a question as to if the data should be open but how. A continued dialogue between these two communities is key to determining how to do so. The five accomplishments above all are worthy of applause. We should congratulate each other for the progress made in bridging open data and official statistics and noting the importance of open data in our capacity building approach. Despite the excitement to see our expectations of the Forum met, we are focused on accomplishing the unchecked items left on our list. + Build trust between key stakeholders and move forward on concerns regarding confidentiality and privacy. As Pali Lehohla, Statistician-General of Statistics South Africa, says, statistics is a conduit of trust. As our data ecosystem expands to include new users, producers, and sources of data we need to increase our trust of one another through interaction, engagement, and partnerships. Open data can be an enabler for that trust by promoting transparency and accountability. At the same time a key concern surrounding open data is privacy, confidentiality, and security. Setting guiding principles on such types of action may be very helpful. + Mobilize resources to strengthen capacities of statistical systems and increase the awareness of current financing gaps. 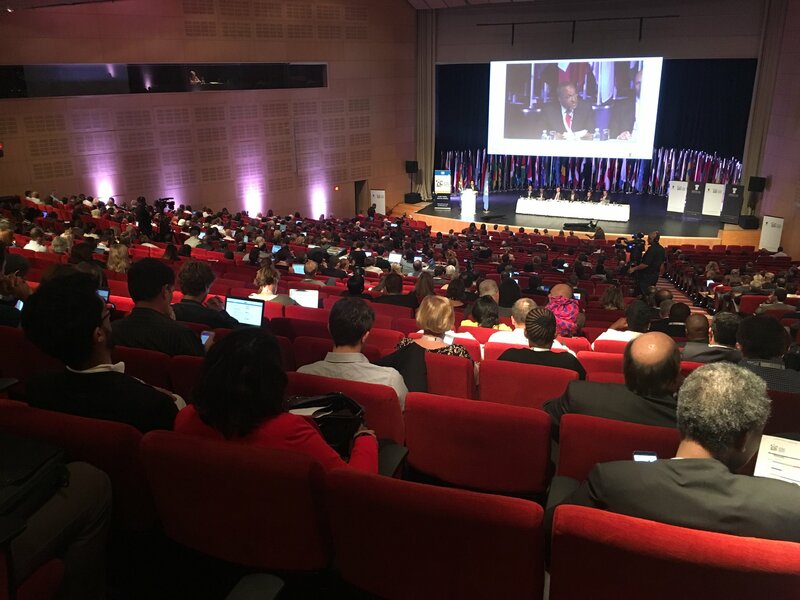 We united in Cape Town under the common goal to achieve better data for sustainable development yet the topic of how to mobilize resources to accomplish that was not well covered. Despite the consensus of the need for better data in development, the resource gap between what we currently spend and what we need to finance the data demands of the SDGs persists. Mobilizing resources to financing the data revolution is only one piece; building a widespread understanding of the current financing gaps and collaborating on how we can close them is the other. At the margins of the Forum, there was a useful first time gathering of the donors to start a conversation around this topic. We hope topics such as resource mobilization, strategic donor engagement, and aid for statistics are more prominently featured in the 2018 Forum and the conversations leading up to it. + Engage high-level policy makers in conversations. While the Forum fostered links between data producers and users as well as civil society and government officials, high-level policy makers remained largely absent from the crowd. Let’s ensure our conversations are heard by those who design and implement policy. From an advocacy standpoint, a timely alignment of a message with policy formulations such as the International Conference on Financing for Development and an engaging demonstration of data use and impact are strategic options. + Continue to learn how to speak new languages, cook, and dance. If you thought numbers and statistics were the only ways statisticians and data experts communicated, you are wrong. Metaphors took over as the preferred means of conveying ideas by some panelists. Lisa Grace Bersales of Philippines Statistics Authority reminded us that we came to the Forum all speaking the language statistics but left speaking new languages of open data, APIs, and the digital world. Julio Santaella, President, INEGI, compared national statistical offices to chefs that should attempt to use new ingredients and test out new recipe while being sensitive to their customers’ needs. Lastly, Sergio Estella, founder of Vizzaulity, compared our ability to communicate our data to the mating dance of a bird used to display his genetic strength. As Stefan Schweinfest of UNSD added, we all need to become better dancers. The UN World Data Forum was a success. It was an incredible display of experts from all over the world connecting to further mobilize the data revolution. While our accomplishments surrounding the Forum should not go unseen, there is still work to be done. It may seem far away but let’s not lose the momentum and energy created in Cape Town. We should strategically think about what we hope to achieve by the second Forum in Dubai in 2018 and beyond in the space of open data, official statistics, and capacity development.